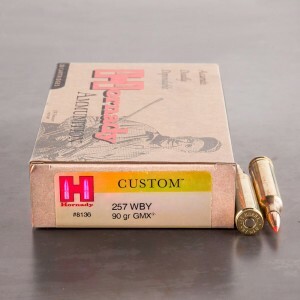 257 Weatherby magnum ammo is a proprietary round made for Weatherby rifles. The cartridge is a 6.5mm x 64.6 mm. round that falls on the upper scale of cartridges. The 6.5mm bullet is known for its flexibility and versatility in weight. It’s capable of being a heavier varmint round, as well as capable of taking medium game. 257 Weatherby Mag excels at taking American whitetail, mule deer, as well as mountain goat and feral hogs. The round loaded with a lighter bullet can take coyote, bobcat, and other medium predators with little damage to their hides. The round is known as being extremely accurate. The quarter bore round is a flat shooting bullet, capable of producing consistent accuracy out to long ranges. The round itself was said to be the favorite of Roy Weatherby, and is the third most popular Weatherby cartridge. In fact the cartridge is known to be quite popular with hunters and sport shooter. The 257 Weatherby Magnum was the first cartridge to use the 375 H&H case, but was blown out, shortened, and necked down for the 6.5mm bullet. Due to the cartridges extreme overbore it is not recommended to fire rapidly, or as a plinking round. Doing so may cause throat erosion, and reduce the life of the barrel. It’s common practice to allow the weapon to cool between shots, as well as practice strict cleaning procedures.